AGM Sweden took place in Borlanger, a small city about 2 hours north of Stockholm, from 17 to 20 May. In Sweden the agm takes 4 days and is common for Round Table, Ladies Circle, Tangent and Old Tablers Sverige (the official name) altogether. That’s a lot of people. There were about a thousand of us, among which only an odd 50 ex-Tablers. 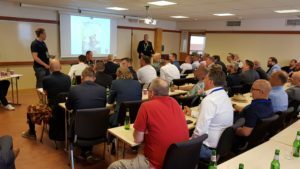 Yes, you have guessed it, the ex-tablers’ club is not fully developped yet in Sweden. Only … clubs. It is not the membership fee that discourages the ex-tablers from joining – it is not even 50€ a year – it is just that the Tablers don’t feel attracted to their elders’ club. 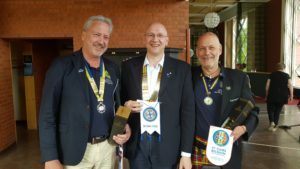 Many of the questions I got was about how my own Belgian association managed to recruit so many of our own ex-tablers. Anders, the outgoing president came to pick me up personally at the airport. On the way, we also picked up Brandur, from Denmark, and Martin, from Italy. The three of us composed the main force of the foreign delegation that was, well, you’ve guessed it again, quite small. Fortunately, we were later joined a small Finnish representation. On the way we had plenty of time to exchange opinions about, among others, the name change, the 41 recruitment problem in Sweden, the case of France, the new international board, the President’s project and Sid’s 41 hamper package. Thursday was registration day, followed by the joint boards’ banquet. It was reserved for the members of the RT and LC boards and their foreign guests however. Strangely enough, only the Old Tablers and Tangent national presidents were invited and their own boards and us (the international guests) were generously treated in a separate grill house. The meat was really good. Then everybody joined for get together party in the main hotel (Galaxen). Friday was dedicated to such activities as playing with a 10-ton bulldozer in a 1 square km sandbox, speleology, or champagne tastings, to name just a few. The evening home-hosting parties were great and well organised. So many people to send to so many destinations everywhere was not an easy task. I counted 9 buses, maybe more… All the food and drinks were catered for in every place. Then we all joined for the party back at the main hotel. 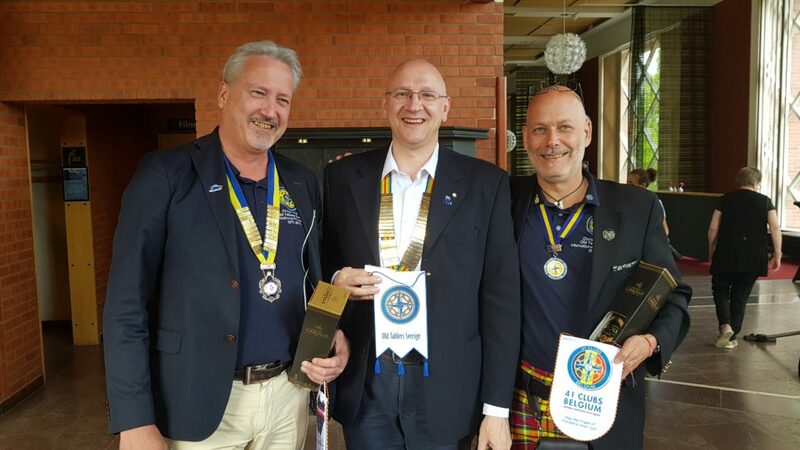 On Saturday the 4 agms took place in the morning. 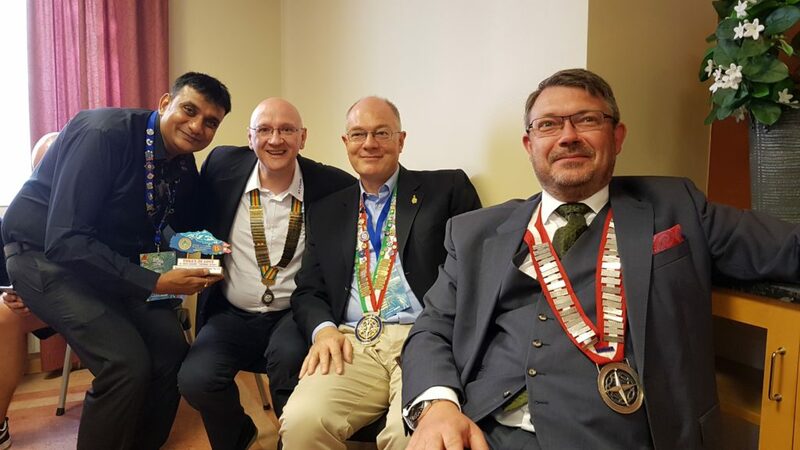 The old tablers new board was elected. 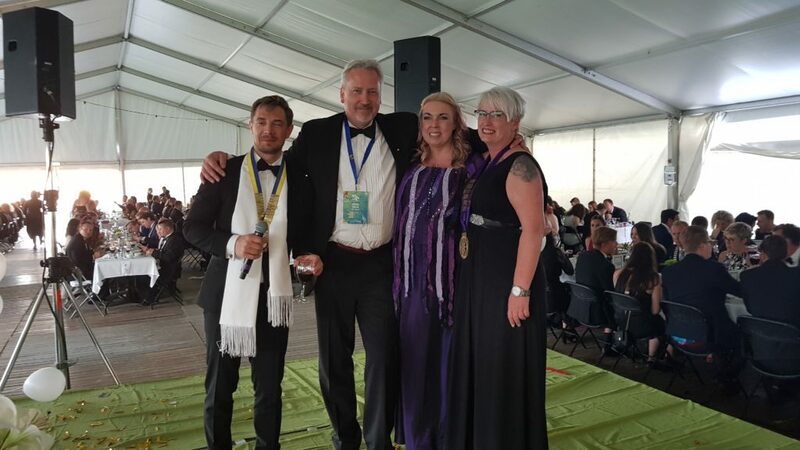 At the time I am writing this report, the new president is now Kristoffer Noordensaaf, the vice president Andreas Hed, the IRO is still Christer Olofsson, the treasurer, Leif Hansson and the secretary Peter Lagerström. Thanks to Anders, now immediate past president, for his reminder. I was given a word to present the greetings and education project of Ulrich, the hamper project of Sid and my personal project for next year : Make a Tabler (or a lady). Part of the discussion was on the names change. Alwo present was a delegation from RT15 Nepal and old tablers Biratnagar in the works, lead by an old friend, Binod Agrawal. The Saturday gala was smashing. The thousand guests were all randomly distributed around long tables for the dinner and all had to dicover their table neighbours. I was surrounded by three charming ladies and 2 young tablers respectively in their 1st and 2nd year of tabling. That felt odd, almost embarrassing, to confess I had accumulated 28 years of RT and past tabling. More than 3 times their combined experience. It was hard not to talk too much about me. But all in all we had some good time. The dancing part was really professional. Excellent bands and decors, theme bars, including beer, coktails and champagne bars, food stalls, quieter resting places full of cushions and even some camping tents for more intimate moments… ! The party was great. At 1.00, it was time for all to leave and enjoy some nice rest. After the Sunday morning brunch, Anders organised my return with a party of 2 ladies and a tabler who kindly dropped me at the airport. Some great agm.